Just wanted to throw down some thoughts here about how beneficial scouting has been for my son, and for my family. Neo went to one of the Boy Scout Troop meetings with his Webelos den last night. As they get closer to transitioning from Cub Scouts to Boy Scouts, they go on some campouts together with the older boys, and also go to a few troop meetings to try to get a feel for which troop they may want to join and what Boy Scouts is like. I was very impressed with the older boys last night. You could see leadership being farmed right in front of your eyes. They led all the activities, and they kept the group as a whole on task. The older boys were all helping each other and the younger scouts. They showed the Webelos how they pitched their tents, what they should bring, organized sleeping arrangements, planned meals, and planned activities. Charlie is already getting interested in following in "Bubba's" footsteps. 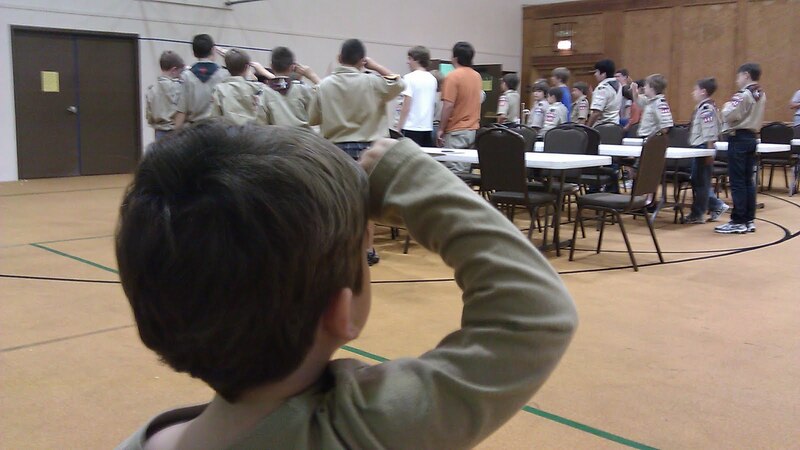 During the Boy Scout meeting last night, I caught him using his left hand to manually pull his pinky and thumb together on his right hand, and then doing the scout salute at the end of the meeting. I'm not sure how long Neo will stick with scouts, or if he'll shoot for Eagle rank, or anything else. But I am sure of how good it has been for him up to now. In fact, I often times think it has rubbed off on me as well (both as a person, and a father). Thanks to all those folks out there that support such a good institution for raising young men.